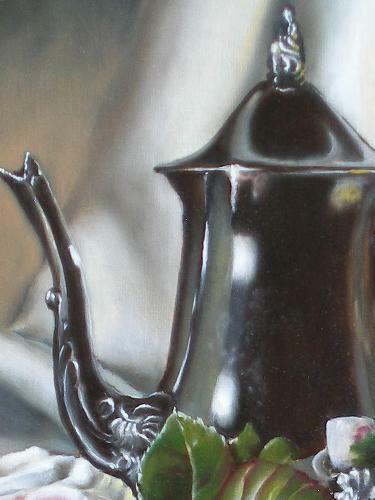 Silver Teapot with Pink Rose still life oil painting. 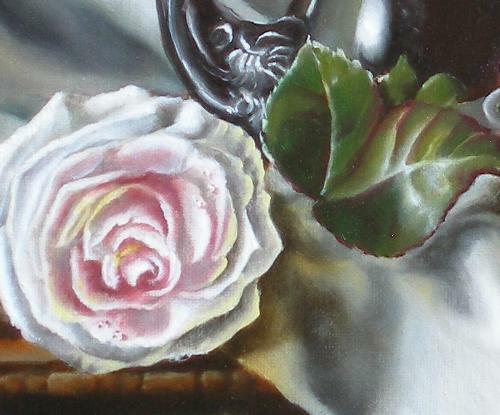 Home > Gallery Page > Silver Teapot with Pink Rose painting. A traditional silver teapot with all it's trimmings! Here's something that can be seen all over the world, as even here in America, we are all becoming tea drinkers! Yes, the tea pot could be used for coffee, but in my house we use the special pot for special occasions. 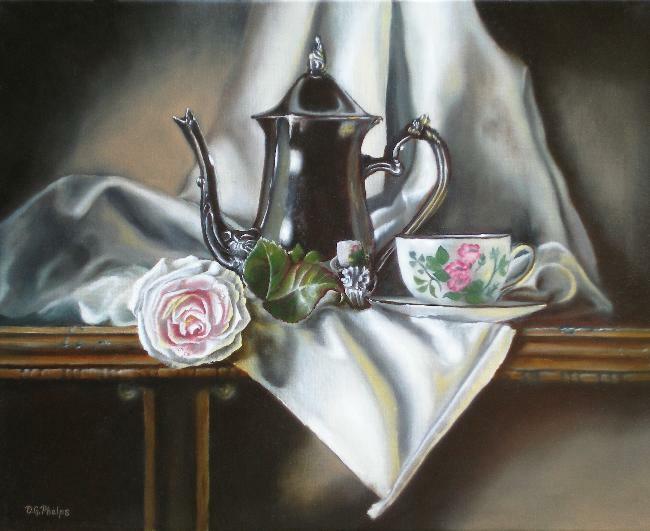 Along with the dainty pink rose and pink rosed tea cup, this still life array is making me crave a biscuit. 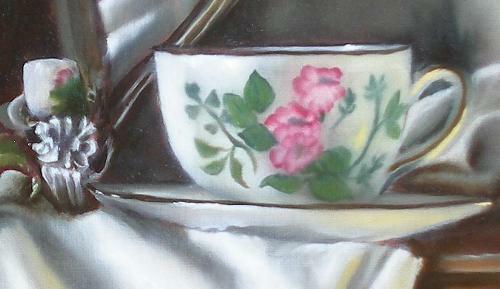 I probably should have polished the teapot up a little more before painting it as looking at the closeup, fingerprints are visible. I had lots of fun both in painting this setup and using it in a full demonstration of the technique. Some things I'd like to point out within the painting. The secondary lighting coming from the fireplace is reflected within the folds of the draped cloth. This puts a certain golden glow throughout the work. My reflection is barely visible within the very center of the silver pot and dew is still dripping from the freshly cut rose just placed on the table. Clicking the thumbnail will expand the view better for you to see this. Also note the cup reflection within the teapot. This brings a feeling of realism not found in more impressionistic works of today. 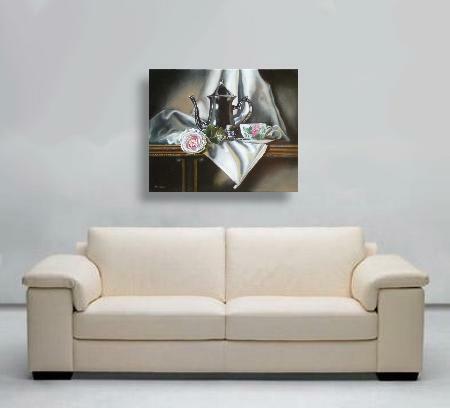 Check out the demonstration of this teapot painting here. It opens in a new window so you won't lose your place here. Check out the pictures below, clicking will bring up a larger veiw. If you're really happy with what you see, and you need a more formal painting to fill a spot in your dining area, hallway, or even a cosy spot in your main living area, Click Here to get pricing and availability. Order your painting here from my Etsy page. 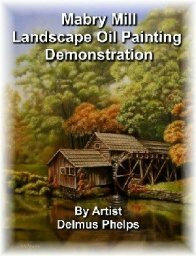 Interested in finding out more on my painting method and a guarantee when buying art online? Just click the link to get more. You can click here to leave my Silver Teapot and go back to Gallery page.